suppose you want to build a house at a seashore. And you want a big sit-out area, bedroom with big windows .. etc etc. now when you go to the architect with your thoughts of your dream house, he will gather all the information . when that fellow got all the information he wants, after some days he will come up with a design. A Dummy Designed Model . while checking the model you got to know that he had done wrong placement of Bedroom with no Parking Area. Now here what if he would have directly implemented this design in real. It would allot of a mess. Demolishing it and replacing it again would cost bulk. But as now we have a dummy model it can be changed easily. Hence with the clarity of the requirement with a dummy implementation called a Prototype model. The prototype model is a Dummy application which is functionally not stable. The main purpose of the Prototype Model is to get clarity on required documents. How this works in IT companies? Assume you are giving the requirement to a business analyst who gathers the requirement from the customer . And somehow if he missed some requirement or got confused. when the requirement is not clear how the software will be developed? with confuse about requirement can anybody build an application? No !! Right !! Here the BA comes with the Dummy application where no features are working only a dummy application for clarity purpose. 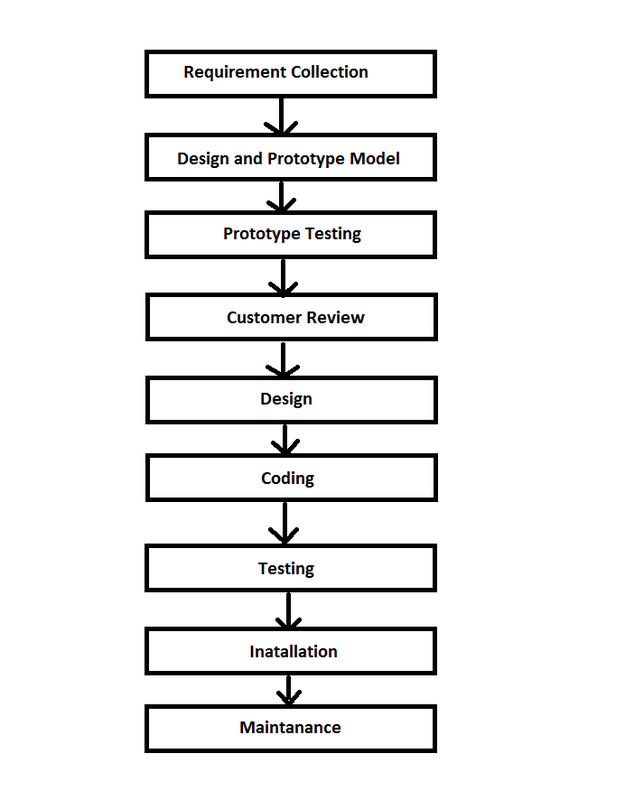 This is how the Prototype Models works shown below. It Improves the communication Between The costumer and Developers. It gives Costumers a Feel How the Actual Application looks like before it is Developed. The whole Dummy Application is developed by the Content designer or web Designer by HTM or CSS Technologies. Here we come up with web pages and then but the images in it and describe it. Dynamic Prototype:- Here we build web pages and then we link these web pages to create a dynamic flow. But in these web pages, none of the Fields will be stable. Helps me to understand the requirement clearly. Cost of rework is less. Improves communication between Costumers and Developers. Causes Delay in actual development . Investment is Required to Develop Prototype.